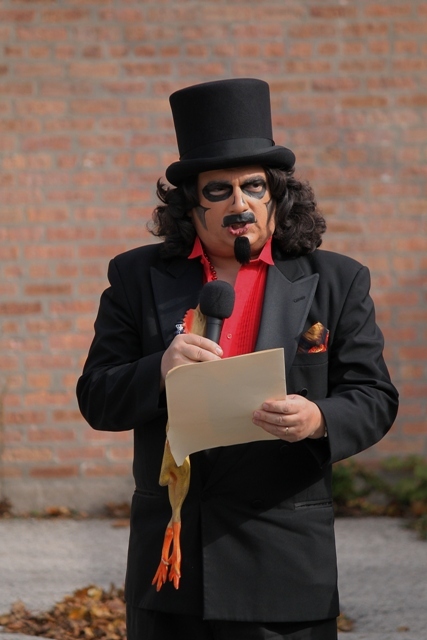 Get well wishes to our dear friend, Svengoolie! We Terror Daves were alarmed today regarding the news of our friend, Rich Koz a.k.a. Svengoolie (news story HERE). Not only is Sven a beloved figure in my native Chicago, he is the very reason this blog was possible in the first place. Back in September of 2009, a message from a Rhode Island fan (who’d grown up with Koz as The Son of Svengoolie when his show aired via a Boston channel) sent a message to the Svengoolie YAHOO forum asking if anyone in Chicago would send him new Svengoolie shows (this was before he’d go national). Although I’d seen and ignored countless versions of this message for years I decided to contact this one and, thus, met the other Terror Dave, David Albaugh. Albaugh and I soon became best of friends and our mutual love of Svengoolie, coupled with a curiosity about horror hosting in general, led to the creation of this blog. Svengoolie had given me years of laughter during a tough childhood. He has continued to make me smile via his TV antics, while also becoming a good friend and comfort to me, these past difficult years. Many people meet their idols and are disappointed. I have the privilege of meeting mine and discovering that he’s even more fantastic than I could have ever imagined. This entry was posted in Horror Hosts, Stalking Svengoolie! and tagged metv network, Rich Koz, Son of Svengoolie, Svengoolie. Bookmark the permalink. My thoughts and prayers are with Rich and his family. Get well soon, Sven. You’re the greatest! Well wishes w/prayers of love to our Uncle Sven… Sending you “Rubber Chicken” hugs!!! !